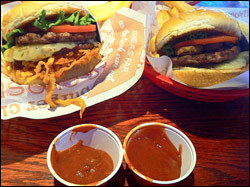 As a few of you in the chilehead world already know, the Red Robin Gourmet Burger chain has introduced two new products this past week that contain the heat bhut jolokia AKA ghost chile peppers. This may be the first time a national, non-chicken wing chain use any type of ghost pepper sauce or condiment on one or more of their menu items. Red Robin’s “Red Royalty” promotional club members first got word of this in emails (as did I) which advertised not one, but two gourmet hamburgers. First is the more mild Cry Baby Style, with ghost pepper ketchup, pepper jack cheese and friend onion straws. Second is the slightly more blazing Fiery Ghost Style, with ghost pepper sauce, pepper jack cheese, plus both fried and fresh jalapeno slices. Both are double burgers.